Devotees on Wednesday thronged the Pashupatinath Temple to pay homage to Lord Shiva on the occasion of the Haritalika Teej festival. Married women fast and wish for a prosperous life of their spouse, which falls on the third day of the waxing moon in the Nepali month of Bhadra. They also savour delicacies known as 'dar' a day before the festival day, as per tradition. Dressed in red, green and orange clothes with beautiful ornaments, women sing Teej songs and dance in the premises of the temple to mark the festival. 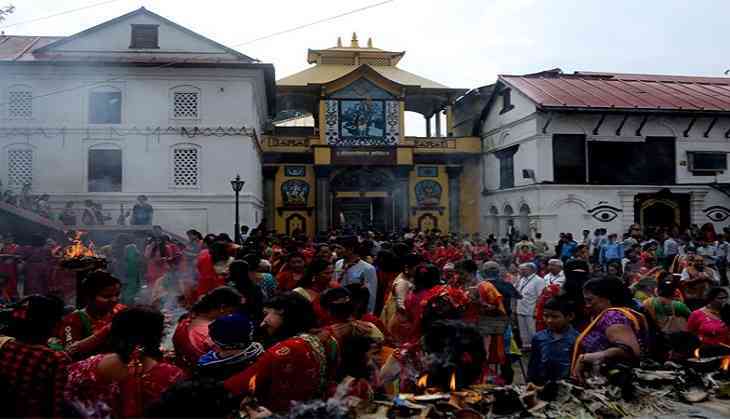 Pashupati Area Development Trust informed that over 300,000 devotees had worshipped at the temple by noon. "Arrangements have been made for facilitating the worshippers, and traffic along Tilganga-Gaushala-Chabahil road close to the Pashupatinath Temple is in operation, easing the movements," said PADT member Dr. Pradip Dhakal. Other temples like Gokarneshwor in Kathmandu, Doleshwor of Bhaktapur, and Shivalaya, Dhaneshwor, Kusheshwor and Halesi in districts outside Kathmandu valley also witnessed a huge crowd, visiting to celebrate the day.